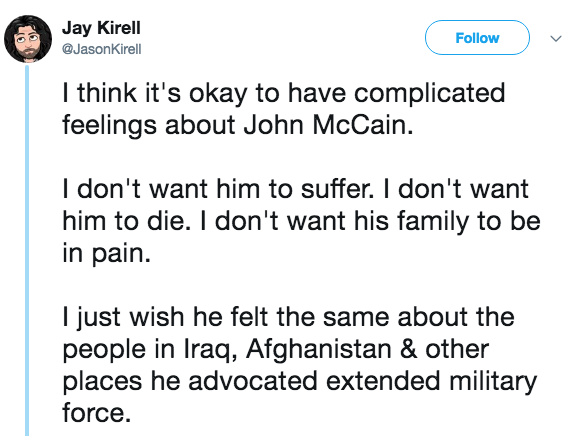 How Did Iraqis, Kurds, Syrians React to John McCain's Death? The death of the Republican Senator from Arizona, John McCain sparked a wave of reactions in the US and around the world, especially in the Middle East, where he was known for being a US foreign policy hawk. McCain was announced dead on Saturday night after a battle with brain cancer. While many of his colleagues from the Republican and Democratic Party have been giving condolences to his family, McCain was also not spared criticism for his foreign policy decisions or his well known dislike of the current President. While McCain and Trump were known for their different views and Trump’s continuous attacks against the senator, they both agreed on one issue, Iran. Trump went on Saturday to Twitter to express his condolences for McCain’s family. For Americans, McCain’s death was received by mixed reactions. His participation in the war in Vietnam shaped a national war hero who battled for this country, in which McCain was a naval aviator and was shot down and tortured by North Vietnamese captors while held in prison for more than five years. 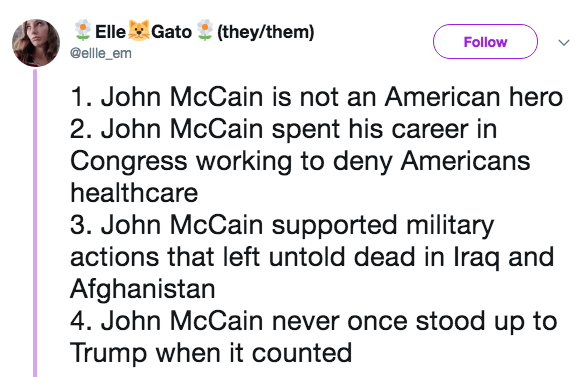 On the other hand, many went to remember McCain’s views on US healthcare system and his support for several causes that caused more destruction around the world. Inside the Middle East, McCain was remembered for his positions and standing up for various causes in the region. For Syrians and Kurds, McCain was remembered as one of the critical supporters who stood for the Syrian uprising against Bashar Assad in 2012. He also defended the Kurds’ cause in acquiring their rights and independence. 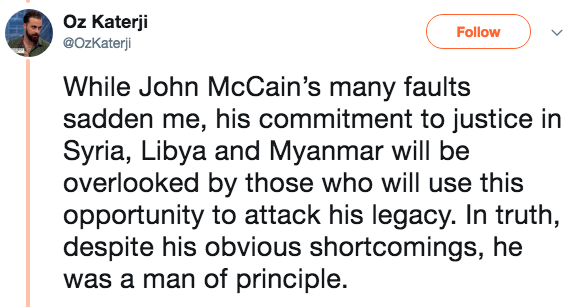 McCain also received condolences from Libyans, as he was a high ranking US official to visit rebel-held Benghazi in April 2011 after people rose up against the regime of Muammar Gaddafi. On the other hand, for Iraqis and Iranians, the case was different. Iraqis remembered the late senator’s support to Bush's 2003 invasion of Iraq. 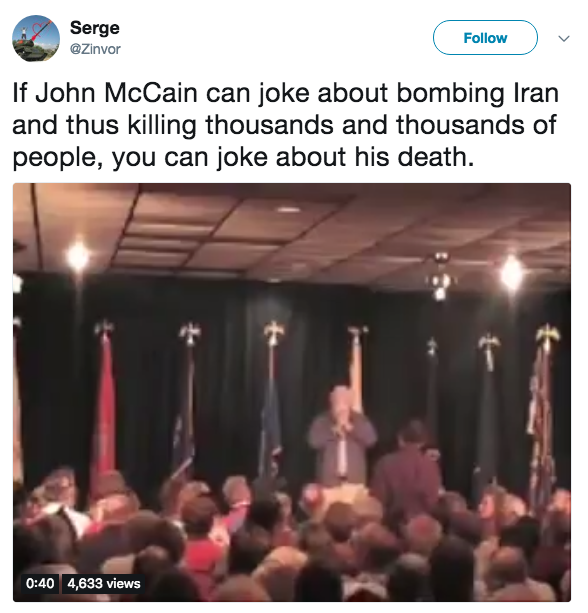 Iranians meanwhile reshared an old video dated back to 2007, when McCain was joking about bombing Iran and started singing: “bomb, bomb, bomb, Iran” during his presidential campaign.